Looking for a church painting contractor? The church exterior is often the first connection the church has with it's neighbors; as such its appearance may make the difference as to if they'll ever visit. But its more than just first impressions, your church is a statement of faith. The traditional church building was designed to be a beacon to the community. 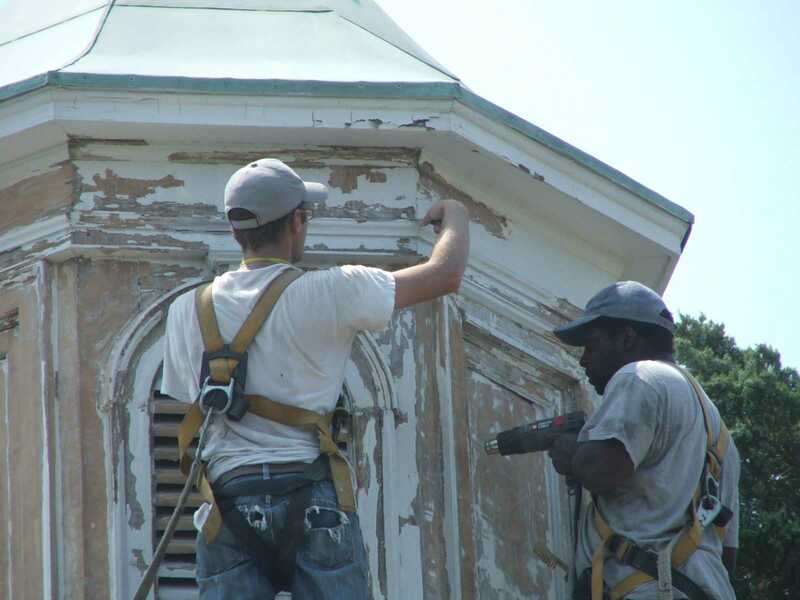 ​​However, exterior church restoration presents multiple challenges for the common contractor. Genesis 28:17 "How awesome is this place! This is none other than the house of God, and this is the gate of heaven." Exterior church painting and restoration is often hindered by soaring heights and steep pitches. This is further complicated by lead paints and years of built up coatings. When your church looks for a painting contractor be sure to hire a painter with experience in historic church painting and restoration. 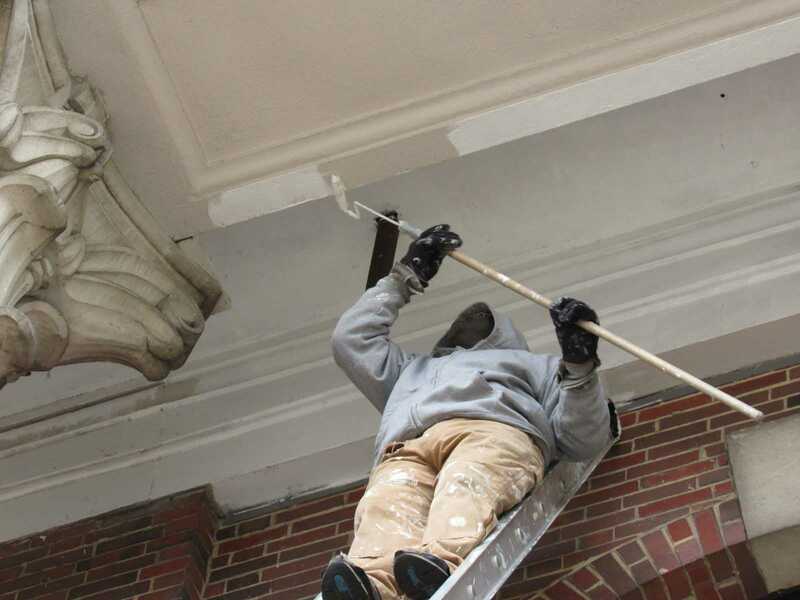 The church painters of Inspired Heights are experienced high workers who know historic paints. But, we don't stop there. Staying current on epoxies and different specialty coatings we are more than just an exterior church painting contractor... we are exterior church restoration specialists. Contractors working on homes and child occupied facilities built before 1978 are required to be certified and follow certain procedures when working around potentially contaminated surfaces. According to the EPA about half of structures built before 1978 have lead-based paint. The likelihood increases with age:  Two out of three if built between 1940 and 1960 and a whopping nine out of ten buildings built before 1940 are contaminated with lead-based paint. Lead-based paint may be found on many surfaces of older churches and when the paint is disturbed during renovation, repair or painting activities, dangerous amounts of lead dust can be created. Jobs such as demolition, window replacement, opening up walls, etc., can also release accumulated lead dust into the environment. Inspired Heights are church painting contractors certified in lead safe renovation. 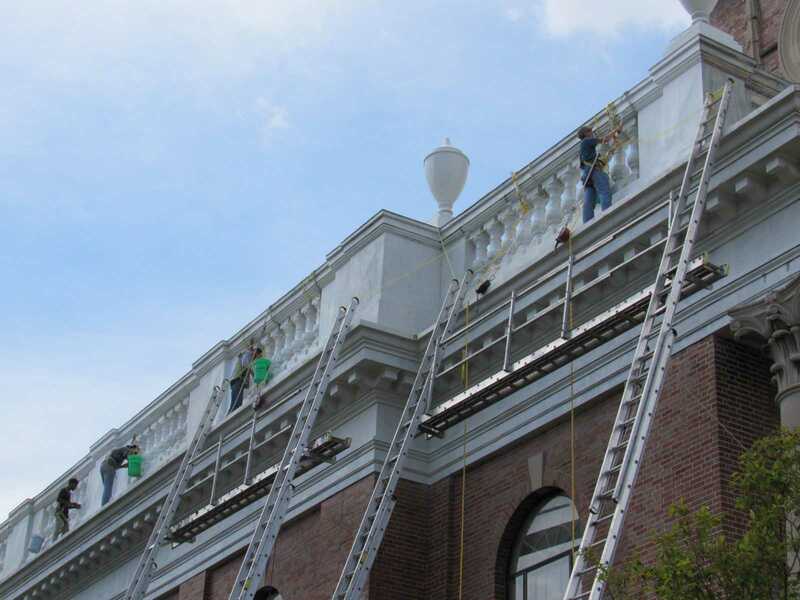 Church painters who are experts in the procedures necessary to assure a safe exterior church restoration. Caulk and fill nail holes, joints and cracks. Replace or use wood fortifying epoxies on softer deteriorated surfaces. Prime all bare wood and patched areas with a quality primer. Wash off dirt, grease and other buildup with the appropriate cleaner. Rinse thoroughly. Remove loose paint, rust and powdery substances. Patch and repair holes and cracks with the proper compound (i.e. fiberglass, epoxy, etc.). Allow to dry, then sand smooth. For glossy or nonporous surfaces, scuff sand to a dull finish. After properly preparing the surface to be painted we then apply a quality paint. The church painters of Inspired Heights are familiar with many quality paints but unless the church requests an alternative coatings recommends the following products. Metallic paints like gold and copper do not typically endure very well, especially outside. The metal flakes in the paint oxidize, rust and tarnish when exposed to the weather and UV rays. However, we have found a quality paint that uses seashells to produce the metallic effect. Therefore, for a metallic finish for your church dome, steeple or exterior we highly recommend Acrymax AF 132P. When painting your church's exterior you want to use a product that will last. There are many "good" paints out there and they vary widely in price but by far my favorite is Sherwin Williams Duration. A thick solid finish that is extremely durable. It's a bit pricey but worth the cost. Let the craftsmen of Inspired Heights keep your church exterior looking its best.